A thousand, one hundred and eleven sword cuts. What is strength? And …can this even be done? These were the questions I asked myself this morning, finding myself about to perform 1111 wooden-sword cuts. 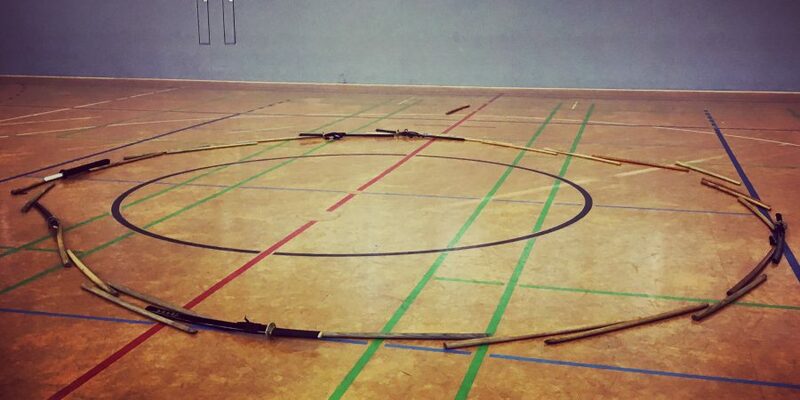 ‘A Thousand Cuts’ is a sword endurance exercise where Haidong Gumdo (Korean Sword Art) practitioners are asked to do 1000 repetitions of ‘Jeong-Myun Begi’, the basic straight cut, while remaining in ‘Kimase’, a deep horse stance. 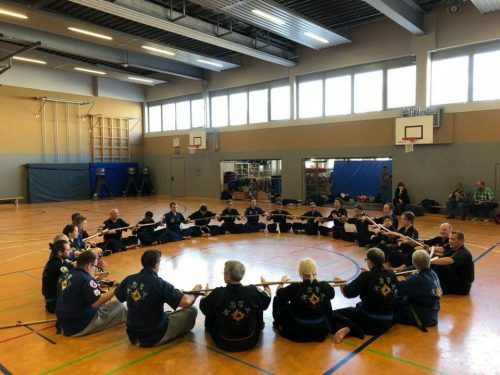 Grandmaster Chul-Kyung Lee of Korea, technical Director of the European Haidong Gumdo Association, had (as legend has it) devised a ‘1111 cuts’ variation of this exercise for a seminar in Bad Kreuznach on Friday 11th of November, 2011 – Exactly 7 years ago. He happened to be our teacher today. 38 Seminar participants from different parts of Germany. Men, women and children – with varying years of experience, belt grades, fitness levels, and swords. Each of us was about to go through the very same experience. I have to admit, I was afraid. I had blisters on my left hand from the previous training day, I had not slept all that much the night before, I’d never tried more than 150 cuts in one go (it was tiring!) and I wasn’t even sure whether a white belt bearer should even attempt this experiment. Somehow I did it. We all did. Each of us made it through the exercise, and we emerged from it.. changed. Was it the group energy giving us flight? A Grandmaster yelling us through it? Taking it one breath/cut at a time? Counting out loud in Korean(! ), just to 10 – but 4 times each? Being asked to stay focused on precision? Seeing everyone move at the very same time? I really don’t know. But it made me think about strength. Is it endurance in the face of fatigue? Is it the absence of weakness? Or positive action in spite of it? Perseverance in the face of resistance? Being kind no matter to whom? Lifting/bearing/pushing/pulling heavy things? Staying calm in the face of a storm? Speaking the truth even when it is difficult? Quitting a bad-for-you habit? Supporting someone when they need it the most? Taking care of yourself as well? Setting boundaries even when it is hard? Looking within instead of without? Learning to do something that feels uncomfortable? Choosing to do right vs easier? Doing your best work even when no one will see? Performing a cut 1111 times? I think it might just be all of the above. And I believe we have more of it in us than we know. What have you achieved/done/created that you didn’t even know you would be able to?